Captain's log, Stardate 54257.3. Baldwin has completed its first month of exploration beyond Cardassian space. So far, we have performed analysis on 14 star systems and charted 96 planets, along with numerous dwarf planets and asteroids. "My, my, my," Patrick commented as he picked up his 3-month-old daughter, "you are indeed becoming a big girl." Tiana smiled as her father held her in his arms. She knew that her father was in a good mood when he lifted the lovely little girl above his head. Bridget entered Tiana's room to join father and daughter. "Hey, sweetie," Bridget said as she wrapped herself around her husband. "I see you're playing with your daughter." "Hi, honey," Patrick replied as he kissed Bridget. "You know how I love the women in my life." "So, what's going on up on the bridge." Patrick place the baby back in the cradle as he prepared his reply. "Same old, same old. We just charted a G-type star system with 6 planets, none of them M-class. We'll be charting the next system in a few hours." Before Patrick could say any more, the room began to shudder and the drone of the warp engines got louder. "Ingrum to bridge, is there something going on that I don't know about?" "We've apparently been caught in a warp current," Jaimie replied. "We're dropping out of warp right now." "I'll be right up," Patrick stated, turning back to his wife. "Are we still on for lunch." "Sure thing," Bridget replied as she kissed her husband. Patrick arrived on the bridge to a scene of chaos. "Status," Patrick stated as he walked to the center seat. "We've disengaged warp engines," Jaimie replied as Patrick observed the warp trails on the viewscreen. "However, as you can see, we're still adrift in the current." Patrick continued to watch the viewscreen as he his next move. Patrick knew a little about subspace dynamics, especially since his sister majored in it at the academy. Unless a 'reverse' warp field is generated to take a vessel out of warp, a warp field can be maintained around an object for some time after the warp engines. Subspace currents can potentially multiply the effects of a warp field, meaning that a ship in a strong 'tailwind' would travel faster and remain in a warp field longer. "Ingrum to Allison, Sarah, are you recording this?" "I am indeed," Sarah answered as she was monitoring the sensors on her control panel. "This isn't like anything I have ever encountered. I'm looking at a current strength of over 25,000 rels." At 25,000 rels, Patrick noted, the weakest subspace field Baldwin could generate would be amplified to a create a field that would propel the ship over 25,000 times the speed of light in 'normal' space, and a reverse field would be ineffective at taking the ship out of warp. "Do you have any idea where we're going?" Patrick asked as he sat down. "The current is flowing at 085 mark 3," Sarah answered. "Based on the most recent current charts, we're well on our way to the Beta Quadrant." Patrick quickly analyzed the situation. It was clear that Baldwin would be significantly off course. Fortunately, the little ship had a sophisticated sensor array. "If there's any ship that gets caught in the rapids, I'm glad it's us. The warp engines aren't able to go cold anytime soon, bring them up to warp 1." At lunchtime, as he planned, Patrick sat with his wife in the Mess Hall. "So, why allow Baldwin to drift in this current?" "We're out here to explore, and besides, if we've got a major current, it would be a help to other ships to know that it is out here." "Point taken," Bridget replied. "I just wonder if this warp current takes us out into the middle of nowhere?" Patrick stared out the window as he formulated his reply. "If anything, it may be as good a place as any to get away from it all." Patrick looked over at his daughter asleep in her seat. "The little one looks so peaceful," he commented. "She doesn't seem to be disturbed by all of this ship shaking," Bridget observed while Patrick caressed her hair, "but whatever you do, don't stand in the way of her feeding." "I better get back to the bridge," Patrick replied. "For starters, we need to know where we are exactly." Captain's log, Supplemental. We have been riding the subspace rapids for 7 hours. We are now over 20 light years off course and have shifted into the Beta Quadrant. As Patrick was preparing to leave the bridge for the end of the Alpha shift, the bridge began to shudder as the crew observed the ship appear to drop out of warp. "All hands, maintain your stations." Jaimie was surprised at the order but listened as Patrick explained his decision. "I'd like to know where we are, and to brief Beta shift, before we cycle through crew changes. Bridget was a bit concerned that we'd be out in the middle of nowhere. We need all the information we can get." "She might have a right to be concerned," Jaimie quickly answered as she examined the preliminary sensor readings. "Subspace current strength is down to zero rels. We have run into a sandbar. It appears to be fairly large, and the only exit is back into the current. Preliminary estimates indicate it's 50 light years by 50 light years by 5 light years. There's quite a bit of nebulous clouds in the region. I'm sure Sarah is beginning to scan - "
Before Jaimie could continue, an interruption came from the War Room. "Allison to bridge," Sarah stated, "I've found something on sensors that I think you'll find interesting. Patrick raised an eyebrow over the news. "Jaimie, would you care to join me in the War Room?" Patrick and Jaimie arrived in the War Room to discover Sarah working on debriefing her swing shift replacement. "You mentioned that you found something interesting?" Patrick inquired. "Yes, I did," Sarah replied. "There appears to be another starship in the area. Right now, it's about 100 million kilometers away, about a half hour at impulse." "Preliminary scans indicate that the other ship is of the old Earth NX class." "You've got to be kidding," Patrick replied. "I've got a visual on it, but it's really grainy," Sarah answered as she brought up a shot of a starship. "Applying enhancement." The starship image was 'cleaned up' on the screen. Patrick examined the image closely. "It does appear to be an NX class. I take it that there's no way to get a close up of the hull." "I'm afraid not," Sarah answered. "If you want a better look at that ship, we'll need to move in." Patrick thought for a moment. Only five NX class ships were built, and all but one of them have been accounted for. "I think it's worthy of a closer look. Ingrum to bridge, set course 125 mark 5, full impulse." Patrick entered the mess hall where his wife was looking out the front windows. "Hey, hon," Patrick said as he embraced his wife. "Hey," Bridget answered, gently wrapping her arms around Patrick. "It's beautiful out there, don't you think?" Patrick looked out the window at the nebula formations before the ship. "Yeah," Patrick replied as he placed his hand around his wife's waist. "However, there may be something special out there." Patrick scanned the view in front of him. "Do you see that speck right there," he continued, pointing out the window. "Sensors are telling us that speck is an old Earth ship." "By 'Earth ship,' are you implying that the ship we're possibly looking at is over 200 years old?" Bridget inquired. "Indeed," Patrick replied as he stroked Bridget's hair and glanced at the baby girl sleeping in her carrier. As Baldwin moved closer to her destination, Patrick held his best friend and soul mate in her arms. For the moment, the Ingrum family was at peace. Jaimie had taken the center seat to allow Patrick some personal time with Bridget. "what is the movement of our bogey?" she inquired. "She's moving slowly through the clouds," Kristy stated. "It's as if she might be collecting deuterium." Jaimie thought about Kristy's comments momentarily. Based on what the war room was telling her, this ship has been out here for two centuries, and probably would need to be collecting fuel from the nebulae which populate the area. "It very well could be the case," Jaimie replied. "We are in visual range," Kristy answered. "Let's have a look." As soon as Jaimie saw the image on the screen, she immediately a call to the captain. "Petrelli to Ingrum. Captain, are you seeing this?" "I am, indeed," Patrick answered as he looked out the mess hall window. Appearing before Baldwin was indeed an old NX-Class starship collecting deuterium using its ramscoops. Patrick looked upon the worn hull of the ship for the ships name. On the front of the saucer, it read NX-03, Discovery. "Two hundred years gone, and all along, she's been out here, holding her own. I'm sure that if there's still a crew over there, they'll be wondering who we are. I'm on my way up." "Sir," the helm officer stated, "there's actually a ship out there, and it's right on top of us." "Let's see it," the captain replied. As the fourth person to call himself the captain of Discovery's generational crew, he had only heard stories about Earth. Never in his imagination could he think that there were other humans looking for them. Yet, the ship that stoop before him appeared of Earth design, right down to the letters on the hull: USS Baldwin, NCC-2013. "Sir," the communications officer interrupted, "They are hailing us." "On screen," the captain answered. "This is captain Kyle Galesburg of the Earth starship Discovery." "Greetings, captain. This is captain Patrick Ingrum of USS Baldwin. It appears we've had the good fortune to run into you." "Needless to say, we've been around here for a while. You probably know more about our predicament than we do. All we really know is that we've been here all of our lives." Hours later, Baldwin and Discovery were docked together. Both captains felt a face to face contact would be a good idea, and Discovery's transporter had long since been taken down. As Patrick walked through the airlock, Captain Galesburg greeted them. "Welcome aboard Discovery, Captain Ingrum." "Thank you, captain," Patrick answered, bringing forward his companion. "This is my wife, Bridget." "Nice to meet you, Mrs. Ingrum," Kyle replied. As you can see, we're kind of a mess of patchwork repairs. She still has a little in her, but to be honest, we're not sure how long it will hold up." "I guess the first question I'd have to ask is, how did this crew survive." "We've basically have been holding our own. We've devoted most of our effort to maintaining life support and the protein resequencers, since we have no way of escaping this place." "Things have changed a lot in the past 200 years. We might be able to pull you out. I would also like to know how you wound up here?" "I'd be more than happy to give you access to the original log entries, if you can read them." "We should be able to find a way, not only to read the original log tapes, but to find a way out of here." "Would you mind if I took a look at your warp drive?" Bridget inquired. "Sure," Kyle replied. "There's not much to her, she's been sitting dormant for a long time." "So," Patrick asked as he small talk with Discovery's captain, "do you have any families aboard." "We've got a few little ones running around on 'B' deck," Kyle commented. "Needless to say, all that we know, we learned from our parents. What about you?" "Bridget and I have a baby girl. Quite a few starships had families aboard until recently, and only now are they starting to come back." The next morning, Baldwin's Alpha shift crew gathered in the conference lounge, along with guests from Discovery. "We have with us this morning Captain Kyle Galesburg and his wife Julie. They were kind enough to give us access to the master log tapes. Based on what we found, we can reconstruct what happened to Discovery." Patrick started with the first log entry. Captain's log, August 9, 2156: In the first month of our battlefield deployment, we have the following tactical analysis of the Romulans. Their ships are slower compared to those of Starfleet; however, the Romulans have shown to be very cunning strategic planners. We have taken damage several times when we were caught unprepared for a Romulan attack. My recommendation to Starfleet is to have Columbia and Atlantis ready to perform surgical 'cavalry raids' on Romulan outposts. This will possibly catch the Romulans by surprise. At this point, I recommend that the rest of the collation not get involved with this war at this time, although it appears that the Romulans' goal is to disrupt the coalition. "Needless to say," Patrick interrupted, "The Romulans had declared war on Earth in retaliation for thwarting a Romulan attempt to destabilize relationships between the Vulcans, Andorians, and Tellerites. You'll be glad to know, captain, that Earth eventually had a decisive victory, and that the coalition born of Romulan interference resulted in a more permanent Federation, which now numbers over 150 members." "So, we know that Discovery was involved in the Romulan War," Jaimie replied. "What happened next?" Replying to Jaimie's inquiry, Patrick played the next log entry. Captain's log, January 20, 2157: While en route to a Romulan outpost, we were swept away by an unknown force. Despite disengaging our warp engines, we continue to head significantly off course. "The 'unknown force,'" Sarah noted, "would be the strong warp current that stretches for at least 20 lightyears." "How then," Kyle asked, "does that explain why we were left to drift into space. I'm curious, please play the next entry." Captain's log, February 1, 2157: We have landed in an area of space where warp drive does not work. I have an effort to escape this area of space. However, we do not have sufficient power to overtake the current that brought us here. At some time, I'm sure that Starfleet will declare Discovery 'lost' to the Romulans. I am preparing to turn this ship into its own independent city, in order to allow her to function for several generations, if necessary, until another Earth ship explores this region of space and finds us. "That was the final log entry, after which Discovery was outfitted for an extended run on its own," Patrick noted. "Now that we have found you, the question remains, can we avoid getting stuck ourselves. Miss Allison?" "Baldwin is significantly faster than Discovery," Sarah answered, "we likely won't have a problem overcoming the current." "Is there any chance," Kyle added, "that you can give us a tow out of here?" "It would require a little more research, but I think that it's doable," Sarah answered. "In that case," Patrick ordered, "Let's get on it." Bridget walked through Baldwin's hallways along with Mrs. Galesburg. "So, have you ever thought about having children." "To be honest," Julie replied, "I haven't given it much thought. I love Kyle very much, but he's always been focused on survival. I also know that some of the couples are having trouble conceiving. How about you?" "Patrick and I met three and a half years ago. We were both a little shy about admitting we were attracted to each other. Once we got off the ground, however, things took off rather quickly." "Kyle told me that the two of you have a daughter. I'd love to meet her." Bridget was used to people wanting to see her little one. "It just so happens that she's right here," she replied, entering the doorway to her quarters. Dorian was keeping an eye on Tiana for her mother. The ensign picked up the baby girl. The baby smiled when she saw that she had company. "Hello, Tiana," her mother said. "I see you're in a good mood." Bridget then turned to Julie, "Do you want to hold her?" "Sure," Julie replied as she took Tiana from her mother. "I must admit, she is a darling." Sarah was working at her console when Patrick entered the room. "You wanted to see me, Lieutenant." Jaimie was the last one to enter the war room as Patrick began the meeting. "Sarah, could you please explain to the rest of the crew what you mentioned to me earlier." "Well," Sarah answered, "in order to break away from the warp current, we will have to go past 'three nines.' and hold that speed for an hour and a half." Bridget was the first to comment. "It is doable; however, I've never had a reason to push the engines past nine ninety-eight. I'd like to run a sim. I can give Jaimie a game plan. I will warn you, there's no way I can guarantee that it will be a smooth ride." As an outside observer of the relationship between Mr. and Mrs. Ingrum, Jaimie noticed that Bridget, like many mothers, has to tendency to be driven in multiple directions at once, including breastfeeding her daughter, being a friend to the senior staff, a wife to Patrick, and a valued member of Baldwin's crew. It is in this latter role that Bridget has been brought back in, and she has been given a challenge: push the engines well past what they had been designed for. If anyone was tasked with performing such a miracle, Jaimie had faith in Baldwin's chief engineer. "Until or unless we find something better, I'll go along with it. How soon can you get the first set of tests?" "I can have something for you in two hours." "Don't get too worked up," Jaimie replied. Bridget may be the chief engineer, but she was still a new mother. "Take a 10-minute break every hour to take care of personal matters." "Any thoughts, Laura?" Patrick asked. "It's crazy," Laura answered, "but it just might work. I take it you'll want me at the helm when it's time to ride the rapids." "You are my best pilot," Patrick followed. His words were more than just words of encouragement. Ever since he brought her aboard, she has constantly impressed the captain with her piloting skills. Knowing that he might have to reduce power in other areas, Patrick turned to Donna next. Knowing what Patrick would ask her first, she quickly proceeded to answer. "Seeing as how we're planning to tow Discovery out of here, I see no reason why we can't have a shutdown on the phasers and torpedoes and divert all weapons power to the tractor beam. I also stand read to help out in sick bay should the need arise." "Very good," Patrick replied. "If everyone is in on this, I don't see any reason to go against the advice of my crew. Make it so." As the rest of the crew disbanded from the war room, Bridget stayed behind with Patrick. "Is there something else?" "I didn't want to bring it up in the group powwow, but do you have any idea on what we are going to do about the little one?" "As much as I hate to admit it, the best place for you is in engineering, and Tiana can be with me on the bridge. It's the most secure area on the ship, and I can put the mini-seat in my chair and strap her in." "I take it that you had that planned for." "I'm ultimately responsible for everyone on this ship, including any and all little ones. It just happens that the only little one on board is ours," Patrick answered as he took his wife's hand. Bridget proceeded to wrap her arms around her husband and moved in for a quick kiss. "In that case, I'd better do my part," she answered. "I'll be in engineering. Let me know when she's ready to feed. Otherwise, I think you know how to handle a three-month-old." Patrick sat in his quarters with his daughter when the doorbell rang. "Come," he said. Jaimie walked in to see Patrick holding Tiana. "I'm sorry if I'm taking your personal time, but I figured you'd want to hear what mom has been up to." "I would," Patrick replied. "How are things going in engineering?" "You gave your wife a challenge. She's running with it hard. She says she will find enough juice to get us out of here along with Discovery." "Meanwhile, I've had the opportunity to have a little daddy time with my baby," Patrick replied as Tiana slept in his arms. Patrick stood up to carry his little one into his cradle. "You seem to have a good hand on the little one," Jaimie commented. "We're all one big family. Tiana's just the youngest member. I have been thinking, however. What do you think about making Baldwin a family ship?" "You mean, allowing families aboard. I guess what's good for the captain would be all right for the crew. Most of the crew do have significant others off-ship. Being a family ship does carry significant risk, however." Patrick knew what kind of risk Jaimie was describing. "However, the Ferengi have a saying-"
"The riskier the road, the greater the profit. Rule of acquisition number 62. I've been reading up." Their conversation was interrupted by the opening of the main door. "I'm sorry if I'm interrupting," Bridget replied, "I just wanted to check in on my baby." "I'll take both of them," Bridget replied as she kissed her husband. "Are you doing all right?" she inquired. "I just put Tiana down in her cradle." Bridget answered with another kiss. "I got to keep an eye on this one," she said to Jaimie, "lest I let him all over me." "I'll have to agree with you on that one," Jaimie stated. "How's the project in engineering?" "Don't worry," Bridget answered, "you'll get your miracle and then some." Patrick and Jaimie took a tour of Discovery's 'family' section. They saw many children playing in the cramped hallways. A five-year old buzzed by as Patrick dodged out of the way to avoid a collision. "Something tells me we may be in the middle of a game of tag," Patrick commented. "It makes me glad that Baldwin's corridors are a bit wider," Jaimie answered. They noticed one of the older children sitting in a makeshift cubbyhole. "Hello, what's your name." "Alexandra," the child replied. "Are you from the other ship." "Yes, I am," Jaimie stated. "Have you ever been to Earth?" Alexandra continued. "Is there really a chance that I will be able to see it, I mean, really see it." "If I have my way," Patrick stated, "All of you will have a chance to play under bright blue skies in notime." "Captain Ingrum," Kyle stated, "I figured that I'd find you here. You asked for a copy of our log tapes." "I have them for you. They are kind of boring, but I figure they might be able to tell some sort ofstory." "Even the mundane could be considered something special," Patrick noted as he heard his combadge chirp. "This is Captain Ingrum." "Discovery, Baldwin," came the reply from Bridget. "I've concluded my final testing. I can give you four nines, but don't expect it to be a smooth ride." "That's enough of a miracle for one day," Jaimie replied. "Clock out and take some rest. We'll get started tomorrow morning." Hearing the conversation between Jaimie and Baldwin, Kyle noted how Baldwin's captain and crew acted calmly under enormous pressure. Then again, he noted, when Discovery was new, the speeds that Patrick is talking about were not even imagined yet. "I take it you're ready to get out of here." "There's a few things that we need to take care of first. For instance, Alexandra, come here." As Alexandra approached Patrick, he turned to her and asked a question. "How would you like to see the hallways of my ship. I know I've got a nice big room to play in." "That would be fun," Alexandra replied. Patrick turned back to Kyle. "It's going to be a rough ride. I was just thinking, it might be a good idea if most of your crew, including the children, came aboard Baldwin. It's going to be a rough ride, and there's no guarantee that we will be able to keep a hold of Discovery. This way, at least, we can get the people and the history aboard." "Your suggestion is reasonable, and I'm sure Julie would be more than willing to watch over Tiana and the kids." Patrick hit his forehead with the palm of his hand at the suggestion. While he had thought of his daughter when making his escape plans, he didn't think about leaving his child with the children of Discovery. "Why didn't I think of that sooner. If Julie doesn't mind watching over an extra youngling, I'm sure Bridget will agree that that would be better than what I had initially planned. Still, I'd better let her know before we begin." Julie was with Bridget wandering through Baldwin's hallways. "So, basically, you have a mad scientist as a father and no mother to speak of and, despite your superior abilities, you turn out as a fine mother and engineer." "Something like that," Bridget responded. "They say that starship chief engineers are something of 'miracle workers,' if that's so, then let me tell you, this is my biggest miracle yet." "I've been thinking, though, while you're performing your miracle work for us, perhaps there's something in return that we can do for you. Would you like for us to keep an eye on Tiana while the two of you are getting us out of here?" "Come to think of it," Bridget answered, that's an excellent suggestion. I'm sure Patrick would agree withme." As soon as Patrick returned to his quarters, Bridget approached him. "Hey, I was just talking to Julie, and she would be willing to watch over Tiana while we tow them out." "Kyle had mentioned the same thing, and I'm ashamed that I hadn't thought of that before. I do think it's a good idea. For now, I say we get a good night’s sleep." "I couldn't agree with you more," Bridget replied as she gave Patrick a good night kiss. As Patrick went to sleep, he felt Bridget snuggle up to him. To him, that was a sign that Bridget had faith in Patrick, and also, to some extent, in herself. He gently caressed his wife's hair as Bridget wrapped her arm around Patrick's back. "I love you," she said as she drifted off to sleep. "I know," Patrick answered as he continued to caress Bridget. "I love you, too." The next morning, Patrick work up ahead of his girls and sneaked out to the mess hall. Adjacent to the mess hall was a room designated on the blueprints as the Captain's private dining room. Patrick, however, never utilized this room for this purpose. Like some of his contemporaries, he turned the private room into his own kitchen, where he could prepare special meals for special occasions. Today's flight, Patrick thought, would qualify as a such an occasion. He began to prepare an earth breakfast known as scrambled eggs and bacon. As he prepared to whisk his first batch of eggs, he heard the door open. "Hey," Bridget stated. "I figured that when you weren't in bed when I got up, you'd be in here." Bridget knows me too well, Patrick thought to himself as he kissed his wife. "Either that, or you asked the computer where I was. Since you're here, would you be willing to help me cook breakfast. I could use an extra hand to handle the bacon." "Sure," Bridget answered as she removed the bacon from the stasis unit. "If you're going to cook for 150 some people, you're going to need one." As Bridget chopped up the bacon, she struck up a conversation with her husband. "I was wondering when you were going to activate your little kitchen." "For someone who remembers the lost art of cooking, even I fall back on the replicator from time to time." "You know, some of us appreciate your cooking talents," Bridget answered as she flashed a flirtatious smile to Patrick. Jaimie was on the bridge when she heard an announcement over the intercom. "Attention: all personnel are hereby invited to the mess hall for breakfast. Our guests from Discovery are also encouraged to come. Come and get it before it's gone." After hearing the captain's announcement, the XO called in. "Petrelli to Ingrum. Is there something going on that I should have been informed about." "Negative, number one," Patrick answered. "I'm simply invoking the captain's prerogative. You are invited to come on down. The bridge isn't going anywhere." "If you put it that way," Jaimie answered, "I'm on my way." Jaimie entered the mess hall to encounter many from both Baldwin and Discovery enjoying breakfast. "Help yourself," Patrick commented. "You know what they say, breakfast is the most important meal of the day." "And we've got a big one ahead of us," Jaimie noted. "So, where are your girls." "Bridget is getting Tiana right now," Patrick answered, "she'll be right back." As Jaimie sat down with her eggs, Kyle took the adjacent seat. "Hello," Kyle stated. "Hey," Jaimie answered. "Are you ready?" "We've got everyone aboard Baldwin for the trip. Julie will keep an eye on the kids, including Patrick's daughter. I'm not sure what else we need to do to prepare. I'm keeping a skeleton crew on Discovery, but as Patrick suggested, most of the crew will be here in the mess hall." "How has having kids aboard affected your ability to run your ship?" "In our situation, it was a necessity," Kyle noted. "But I never had a problem with the kids on the ship. Those aboard knew we had to make sacrifices. The crew that have little ones say they wouldn't miss it for the world." Before Jaimie could answer, the door opened, and Bridget entered with Tiana in tow. "One thing's for sure, your captain seems to enjoy his baby." Bridget approached Julie with her baby. "Take good care of her." "I've watched over young ones before," Julie noted. "Your little princess is in good hands." Bridget flashed a sheepish grin as Julie her comment. "Patrick was the one that named her. Her name literally means 'princess.'" "So, are there any juicy stories of crew fraternization?" "No, but I think our XO has been starting to think about her beau," Bridget noted, "He's posted on another ship, however." "How's the food?" Patrick inquired as he approached Bridget and Julie. "Very good," Julie answered. "It's got a stronger flavor than I'm used to. I guess 200 years of use has taken a toll on our protein resequencers." As Julie continued her meal, Patrick went to his little one. "Hey, little one," Patrick said to Tiana, "How's are you doing." Tiana, on seeing her father, delivered a smile as he picked her up. "We're going to go on a ride in a little while, this nice lady is going to look after you." "How rough do you think the trip is going to be." "I expect that the inertial dampers will be put to the test," Bridget said. "I suppose you want me to make sure she's secured." "Yes," Patrick and Bridget responded in unison. Captain's log, Stardate 54262.6: Baldwin is preparing to tow Discovery against a heavy headwind. Going against this 'wind' itself is a formidable task; bringing Discovery along for the ride means that we will be putting this ship and crew to the test. This ship and crew have thrived through challenges in war; I expect us to thrive in peace as well. As Patrick finished his log entry, he pressed a button to make an announcement. "Attention, all hands," Patrick announced, "we are ready to head back to Federation territory. It is going to be a rough ride, but I have faith that we will get through intact. Red Alert, all hands to duty stations." As the klaxons sounded, Patrick turned to the tactical station, "Donna, engage tractor beam." Glowing blue streams burst from Baldwin's aft end, striking Discovery's saucer section. The towing ship lurched forward slowly, bringing the towed ship along for the ride. Jaimie issued the next set of instructions to the conn. "Laura, set course bearing 005 mark 10 and prepare to engage at maximum warp." With Discovery in tow, Baldwin's warp coils glowed their usual bright blue as the ship streaked ahead. To those on Baldwin familiar with warp travel, it was quickly apparent that the ship was dragging through the swift 'headwind.' The turbulence began as a slow rumble heard by all. "We are at Warp 5," Laura noted. "Steady as she goes, lieutenant," Patrick answered. The scene in the engine room was calm and collected. With the warp engines engaged, the engineering team monitored the warp engine as it was slowly put to the test. As Baldwin reached warp 7, the floor began vibrating. As the engine was throttled up, the vibrations became more violent. The engine crew was aware of the rumble and were also working to reduce their impact as much as possible. "Collins, Green," Bridget stated, "Monitor the inertial dampers. Becker, keep an eye on the plasmainjectors." Meanwhile, in the mess hall, Julie sat and calmed the children. She started signing simple songs with the kids. Alexandra was among the children. She had met Baldwin's captain and thought of him as nice. With Julie distracted with the other kids, Alexandria sat next to Tiana's carrier. "Hi," she said. "I've met your dad. He seems to be a nice person. He was certainly nice to me. I know your parents are busy working to let us see beyond our ship for the first time, but I'm sure you understand." The mess hall rocked swiftly as Baldwin continued to accelerate. Despite the chaos going on around her, Tiana smiled back at Alexandria. "We are at warp 9.9," came the announcement from the engine room to the Bridge. " I'll keep working on smoothing the ride." "Acknowledged," Patrick answered as the ship rocked again. "However, remember that safety comes before crew comfort." "You don't have to tell me twice," Bridget retorted. "We're starting to make headway into this current," Laura noted. "We're climbing to 9.93." As Baldwin lurched forward into the subspace current, the children in the mess hall were huddled together, as Julie every effort calm and reassure them; however, the woman watching over Discovery's children was not sure herself. She was told that it would be a rough ride. It did not prepare her for just how 'rough' it would be. She looked over at the only child that was not from Discovery. Tiana sat quietly in her carrier, and, if anything, appeared to be content. At least she is not spooked by the rough ride, Julie thought. Alexandria had also noticed the calmness that the captain's child had been displaying. "Don't worry," she stated to her peers, "we are on our way home." "Power output is on the red line!" Bridget exclaimed to the bridge. "I'm giving you all that these engines have." "You've pushed our engines just far enough," Patrick answered. "That'll do, sweetie." "Acknowledged," came the reply from the engine room. 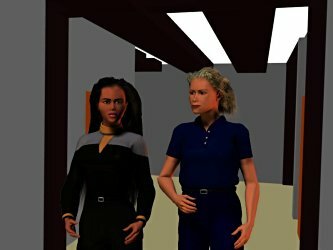 Jaimie gave a look of disbelief that the captain would slip in affectionate jargon in the middle of a tense situation. Despite the implied breach of protocol, she turned to the operations panel. "Kristy, what is the status of our tractor beam." "We have a strong lock on Discovery," Kristy answered. "I think we're good. Based on Sarah's calculations, we should be free of the current in 90 minutes as promised, then it will be smooth sailing back to Earth." Captain's log, Stardate 54265.2: We have notified Starfleet Command of our impending arrival in sector 001. After a bumpy ride out of the subspace current, we have dropped speed to perform maintenance to the warp drive systems. Patrick, Bridget, Jaimie, and Sarah met in the conference lounge to go over the previous day's events. The head of the cartography department was the first to speak. "The charts and maps prepared in the war room were very accurate. The path that I had projected matches up to Baldwin's actual path." Bridget was next. "Needless to say, our use of high warp has taken its toll on our engines. But once we were out of the rapids, we were able to find another current and throttle back the warp drive so that we could get them back in shape." "That much is obvious," Jaimie noted. "However, I would like to know what the effect is on crew morale in the engineering section." "Morale, for the most part, has been good," Bridget answered. "my team was expecting a bumpy ride. They did not panic when things got rough. In fact, they performed as admirably as they would under smooth sailing conditions." Before Patrick could add his comments, the doorbell rang. "Come," Patrick stated, his directing the person at the door. "I'm sorry if I'm interrupting things," Julie said as she entered the conference lounge. "There is someone here that I thought you would like to hear from." at Julie's motion, Alexandra walked into the conference room. "Hello, Alexandra," Patrick replied. "I hope the trip yesterday was not too scary for you." "I wasn't scared," Alexandra answered. "You had given me your word that you were going to take us to Earth, and I took that you would keep your promise. Also, I noticed someone else who was not scared, and she was even younger than me." Jamie and Bridget opened their eyes wide as they heard Alexandra. They, along with Patrick, had a good idea who Alexandra was talking about. "During the whole trip, whenever I looked over at Tiana, I always saw a smile on her face. I could tell that the baby had they in her parents, and that there was no way her mom and dad would ever let her down." "Apparently," Jaimie noted, "your little one has quite an impression." "Thank you, Jaimie," Patrick replied. "I think the entire family deserves a pat on the back. We've found a lost starship, and we're bringing her home. I do believe I have one last promise to someone." As he finished his thought, he looked directly at Alexandra with a knowing gaze. "Baldwin, Orbital Control. You are cleared for standard orbit, along with Discovery." "Orbital Control, Baldwin," Jaimie acknowledged. "We are cleared for standard orbit. We'll be releasing Discovery into standard orbit under her own power. Baldwin is also requesting permission to dispatch one runabout." "Acknowledged, Baldwin is releasing one runabout into orbit. I'm sure that Starfleet Command will be interested in a meeting the crew from Discovery." "Actually, the runabout would like to land in a nice open area with good weather." "I think I know the perfect place," the Orbital Control operator replied. "We've got perfect weather on the Colorado Front Range. I'll clear a flight path." "Neosho, bridge," Jaimie stated, turning her attention to the runabout. "We're clear for launch. The folks over at orbital control are clearing you for the scenic route." "Neosho acknowledges," Patrick answered. "All right, kids, watch this." As Neosho lurched out of Baldwin's shuttlebay, Alexandra and the children from Discovery were presented with their first view of a glowing blue sphere, which before now, was merely legend. Neosho swung around to the night side of the planet, revealing the lights around the major urban areas. Neosho quickly descended into the atmosphere over the Western Pacific. The children were in awe when they saw the red fireball of Earth's sun emerge over the ocean before them. Patrick's thoughts were interrupted by a message from the flight planners. "Neosho, weather control reports that they are directing a typhoon into your flight plan. You may not want to stay that low." "That typhoon is nothing compared to the turbulence we went through just to get here," Patrick commented, "However, I think these kids would prefer a view above the storm." Patrick took his runabout above the clouds that formed the tropical cyclone before him. The children were inspired by all that lay before them. None of them had ever seen a sunrise or clouds. Patrick took the children just high enough to avoid the turbulence caused by the storm, passing close its center. "That cloud looks like a bowl," one of the children stated as Neosho flew past the eye. Continuing east, Neosho flew past the Golden Gate bridge and Starfleet Headquarters. He quickly found his way over the desert of Nevada and across the plateau of eastern Utah before crossing the Rockies. On the far side of the Rockies, Patrick was directed to a cleared spot along the Colorado front range in a meadow. As soon as Neosho landed, the children were scattering for the door. "Patience, please," Patrick said as he moved over to the doorway to let the kids out. As Neosho's door opened and the kids exited the runabout, the children ran out to play. One child stopped to thank the captain. "It's as beautiful as I thought it would be," Alexandra commented. "I said I'd bring you under blue skies," Patrick answered, "and I know how to deliver. Now, get out there and play with the other kids."